Lowes Wire racks are among the more popular home improvement items sold in this national chain. 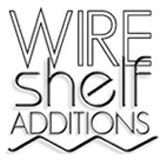 At Shelf Additions, we carry an extensive line of Lowe's wire rack accessories, our own wire rack shelving solutions, as well as offering modifications and parts for “big box” retailer systems. A Lowes wire rack popularly features wire shelving for streamlined space saving and storage solutions. They are adjustable, fixed and available in different sizes, lengths and configurations. Moreover, if you are planning to reorganize your home you should use good quality shelves to keep everything organized. After all, who wants to have an unsightly home? If you have children, then you will have so many items, including books and toys, which should be arranged properly. There are different kinds of shelves which can be very suitable for storing different items like your clothes, books, toys and all of the other things which you have gathered over the years. One of the best options for space saving and organization is a Lowes wire rack. Lowes wire racks are easy to assemble and can be the perfect solution to arranging items in closets, garages, offices, and just about anywhere around the house. Lowes wire racks are used for both domestic and business use. Industries will use the racks to store different kinds of goods and raw materials. When buying the shelves make sure that you know the weight capacity of the shelves. This will help you to decide how many items you should store on them. If you need accessories for your Lowe's wire rack, look no further. Our wire rack accessories allow you to customize your Lowe's wire rack as you see fit. From wire shelves and top posts for expandability to wheel casters for mobility, Wire Shelf Additions supplies various kinds of wire shelving accessories for your Lowe's wire rack.